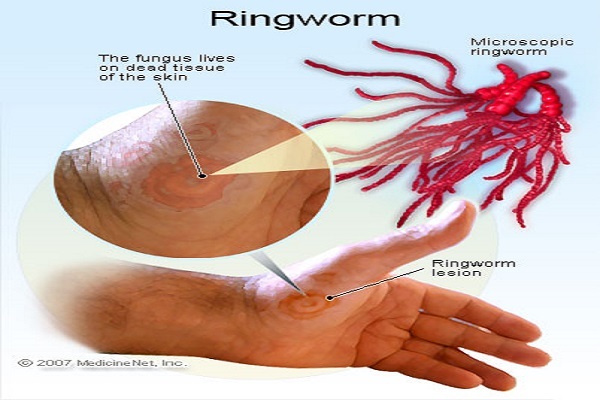 Ringworm or Dermatophytosis is a very common fungal infection of the skin which affects humans. Going by the name, one would assume ringworm to be caused by worms but actually it is caused by fungi. The fungi derive sustenance from keratin which is the material that makes up the outer layer of our skin. Although these fungi find a good breeding ground in warm and moist places they can also survive on dry surfaces such as hair shafts. The infection manifests itself in the form of raised, round scaly patches often accompanied by redness, itching and inflammation. There are a lot of home remedies which can cure ringworm some of which are mentioned below. Ringworm can be cured by these home remedies but have a chat with your doctor if you find the fungus spreading or the symptoms persisting. This might be one smelly remedy but garlic being a great antifungal agent it can help treat ringworm symptoms very well. Take a few cloves of garlic, crush them and apply them to your infected skin. You can apply this several times a day. After a few days you will see the symptoms disappearing. Neem is well-known for its antifungal, antibacterial and antiviral properties. No wonder, it has been used in India since centuries to treat various ailments. It is highly effective against many forms of skin diseases. To rid yourself of ringworm, make a paste of neem leaves combined with equal amounts of turmeric powder and sesame oil. Combine this well and apply this paste to the affected region. You can also apply neem oil or a mixture of neem oil and aloe vera gel to the skin. Continue applying this daily until you see the rashes disappearing. Apple cider vinegar is quite effective as a home remedy against ringworm. Many people swear by this mode of treatment. Its antifungal properties help in ridding oneself of ringworm. Take a cotton ball dipped in apple cider vinegar and apply it to the affected area. You can apply this mixture 3-4 times a day. Regular application of apple cider vinegar should see you free of the symptoms in a matter of days. Tea tree oil has been used by people since long to treat many illnesses, ringworm being one of them. Tea tree oil’s healing properties make it one of the preferred modes for treating various illnesses. Dip a cotton ball in tea tree oil and apply to the affected area. Use it twice a day to see good results. If you feel a burning sensation on applying tea tree oil, you can also dilute it by adding water to it and then apply in a similar manner. Papaya seeds are very effective against ringworm. This is a very easy and simple method whereby you can get rid of the fungal infection. Crush a handful of papaya seeds and apply it to the ringworm affected area. By regularly applying this you can see the symptoms wearing off.Alternatively, you can also rub a papaya slice over your skin. Aloe Vera, that magic ingredient, which is a favorite with the cosmetic industry incidentally also has the ability to cure you of ringworm. Cut open a fresh aloe vera stem, remove the gel and apply it your skin. Continue applying this daily till you get rid of your illness. Applying turmeric paste to the ringworm affected area is a highly effective way of getting rid of this skin disease. Turmeric’s antibiotic properties ensure that the infection does not recur. Add some water to turmeric and make a paste. Now apply this paste to the infected area for about 3 times a day. Myrrh has excellent antifungal properties, thus it can be used in the treatment of ringworm. Mix equal amounts of myrrh and goldenseal with water and make a paste out of it. Next, slather this paste over your rashes at least 3 times a day to see positive results. Colloidal silver is a wonderful antibiotic which has the ability to destroy microorganisms. This colloid available in both gel and liquid form can be applied directly to the skin to relieve symptoms. You can apply colloidal silver to your rashes 2 times a day. Continue with this process everyday till you see the rashes reducing. Iodine is quite potent against ringworm as it has both antifungal and antiseptic properties. Before you apply iodine, clean your skin with a good anti-bacterial soap. Now dab the area with a cotton ball soaked in iodine solution. You can apply this 2-3 times a day. Licorice root is a wonderful anti-fungal agent hence it can cure you of your ringworm infection. To one cup of water add about 6 teaspoons of licorice root powder and boil the mixture for 20 minutes or so. Allow it to cool and then dab on your affected skin with a cotton ball dipped in this solution. For good results apply this solution 2-3 times a day. Lemongrass is again a very powerful antifungal and anti-inflammatory substance. Lemongrass tea helps to remove the harmful toxins from the body and also keeps one healthy. Do not throw away the used lemongrass tea bags. You can apply them to your skin which is affected by ringworm. Similarly, you can apply a paste of lemongrass leaves and buttermilk to the ringworm affected skin. Mustard seeds too provide certain amount of relief from the itch and irritation caused by ringworm. Take a handful of mustard seeds and grind them to a paste along with water. Apply this paste on your skin to get a modicum of relief from the irritation. Infections of the scalp can be treated well with this method. Simply apply a healthy dose of coconut oil to your scalp and leave it overnight. Wash it off in the morning. Not only will you get relief from the itching but it will also prevent build-up of the infection. Since ringworm is a fungal infection, it becomes difficult to eliminate it. However by following certain precautions one can prevent the disease from spreading. Do not share your personal items such as clothes, combs, towels, bed sheets etc. with others. Wash your clothing in hot water to which antimicrobial detergent has been added. Pets can also be infected with ringworm, so avoid touching animals that have bald patches on their skin as they could be carrying the disease.